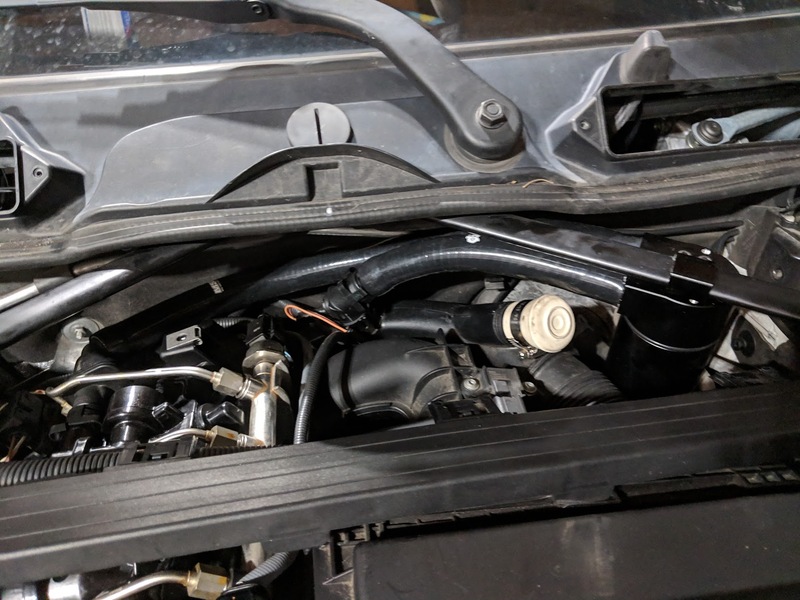 Here's an "improved" plumbing setup, at least in my opinion, that I came up with while working on externalizing the PCV on my N54 E90. 1. Lets restrictions from kinks in piping and pressure drop due to length of the hoses. 2. Doesn't require cutting of the acoustical engine cover. - Assorted tools...utility knife, fine tooth saw blade, screw drivers. 3) Remove the PCV flapper pipe assembly. 5) Disconnect the sensor that is located on the PCV pipe elbow on the rear intake. It's held in by single tab that need to be lifted up with a screw driver. 6) Now remove the PCV elbow itself. It's attached to the rear inlet pipe via two tabs. As you can see there is a notch cut into the rear inlet pipe to clear the base of the PCV elbow sensor. We will need to cut the same notch on the opposing side of we can install the same elbow flipped 180* so that it point toward the actual oil catch can. 7) Now you need to come up with a plug to cap off the hole in the rear inlet to keep debris from falling into your inlet! Turn out US Half dollar is the perfect diameter for this purpose. Who keep half dollars around you ask? Me for one. But you can come up with your own jig. I wrapped the half dollar in some masking tape for ultimate seal and also made a pull tab for it to make it easy to remove. 8) Insert your pipe plug and used the saw blade to cut two vertical cuts width of the sensor base down to the same depth as the existing notch. Then use utility knife to score a horizontal line at the base of the two cuts. Finally use pliers to break off that piece of plastic off forming the new notch. 9) Reinstall the PCV elbow rotated 180* from it's original orientation. This layout is so ideal that with some finagling the factory PCV pipe can actually be reused to connect to the oil catch can. 11) Install the catch can to the strut brace. 12) Reinstall the flapper housing. 13) Cut hoses to size and install them. 14) Reinstall the engine cover and underhood cowl. Nice! Thanks for the info. Note that the sensor you refer to is actually the power supply to the electric heating element in that PCV elbow. I'm sure you noted the copper insert in that elbow. That heater is to prevent ice formation due to the pressure drop across the end of that elbow under high flow conditions that can cause water vapor in the crankcase vent to condense and freeze. Ah interesting. I figured is some type of funky temp sensor due to the copper insert. Close enough! Very cool! I'm going to try this. Please share info on the PCV elbow. I'm having an issue fitting the hose that came with the catch can onto the check valve. It looks like the silicone hose diameter is not big enough to fit around it. Last edited by N54Society; 04-08-2019 at 09:54 PM. That doesn't look like the check valve in your hand. That looks like the PCV elbow with the electric heating element inside. Anyway, what you may need to do is take the stock hose that fits there and remove the plastic ribbed hose from the end fittings. Then put the snap on end fitting with o-ring onto that elbow. Then put your new silicon hose onto the end of the fitting where you removed the ribbed plastic hose. Separate the original plastic ribbed hose from the fittings where the red arrows are shown and you should have male ends that will accept the typical 19mm / 3/4" rubber hose used for oil catch cans. See the end fitting that was re-used (green arrow) with the new catch can hose in the second photo below. Last edited by arkie6; 02-11-2019 at 12:44 AM. Indeed! They are on pretty tight, Make sure to use a heat gun. Cool. Glad ya figure it out & other helped. Sorry I don't browse on here too much. Especially since in winter time when the 335i is put away. Come to think of it I added high side catch can using similar setup and BMS style can since making this DIY. Season is changing here and I just got done doing the M3 LSD swap today! No worries. Thanks for the informative post. I would consider this an improvement to the stock setup in a lot of ways. Can you elaborate what a high side catch can is? Is it like the one I installed? Sorry when I said high side catch can loop, I meant low side, doh. The low side is the loop that "recirculates" oily air into intake during vacuum conditions (when you are off boost).